A Los Angeles transplant, Sister Louise “Lou” LaSalle feels right at home in Briar Coast, New York. After all, her beloved nephew, Chris, works at the college founded by her congregation. But while Sister Lou has always played by the rules, she’s about to have her faith in herself tested—by murder . . . Sister Lou expects some pushback when she invites her friend, Dr. Maurice Jordan, to be the guest speaker for the St. Hermione of Ephesus Feast Day presentation. The theology professor is known far and wide for his controversial views. What she’s not prepared for is finding him dead in his hotel room, bashed over the head. When the local deputies focus on the members of her congregation as suspects, Sister Lou takes matters into her own hands. Against Chris’s wishes, she teams up with a cynical local reporter to delve into Maurice’s life. The unlikely partners in crime-fighting uncover a litany of both devotees and detractors. 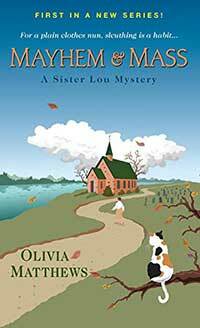 And though it might take a miracle to find the killer, Sister Lou vows to carry on until justice prevails . . .